Back a month or more ago, we visited Athens, Greece. It was our second trip there. We were there back in the early '90s. 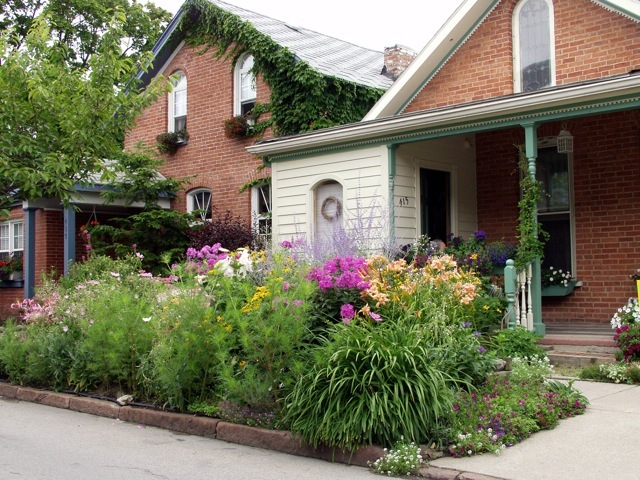 There's not much gardening going on, it's a huge very urban city. 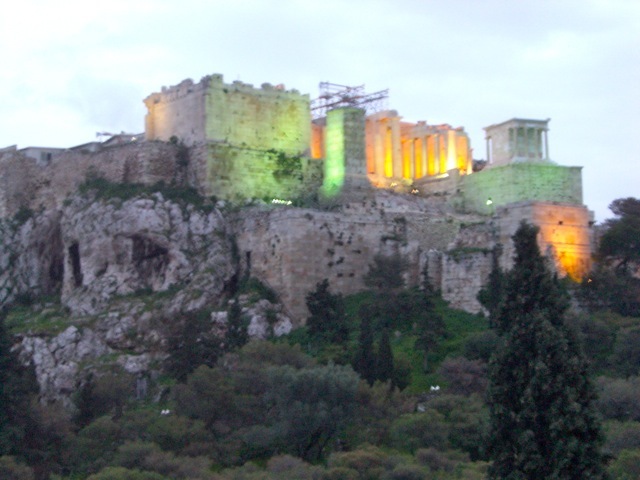 When you're there looking up at the Acropolis & Parthenon, it's one of the most beautiful sights in the world. 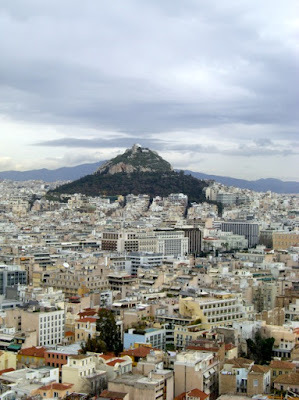 But when you're up on the Acropolis looking out over the city, it's a drab flat, urban cityscape. around the ruins of the buildings. 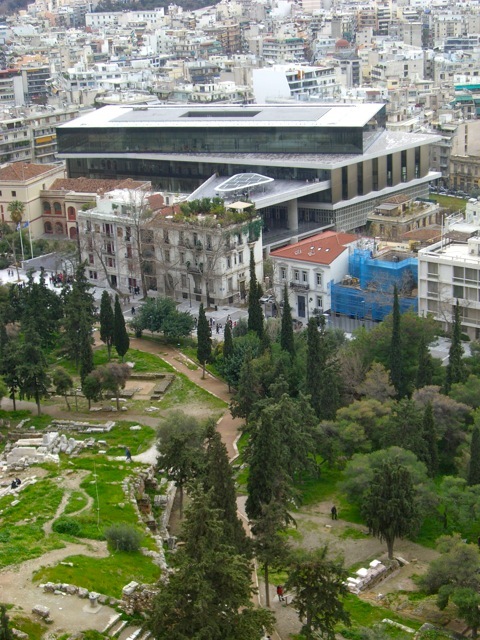 But if you look down just below the Acropolis, you can see the beautiful new Acropolis Museum, which hasn't been open even a year yet. 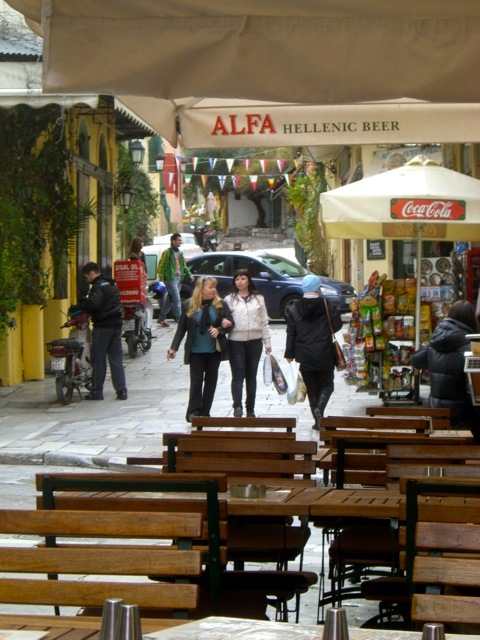 And you can see the Plaka, a friendly neighborhood of touristy shops, wine bars cafes and restaurants. You can also see the ruins of the Ancient Agora of Athens, the center of ancient Athen's former Roman government and law courts. 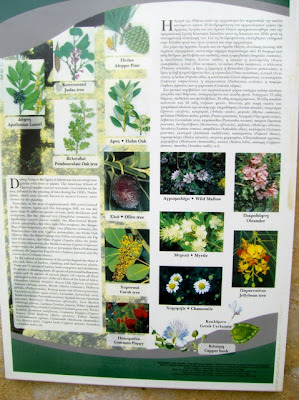 It's all part of a protected park (not prortect4d from stray dogs though -- they were all over the place). 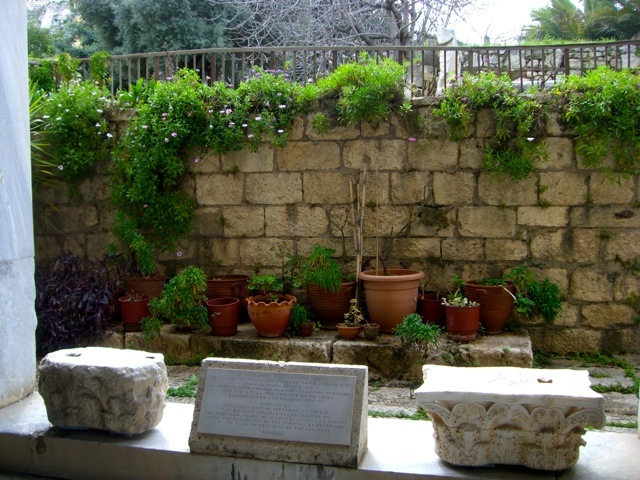 There were no trees or plants when the agora was built, but during excavations in the 1950s, native trees were planted. 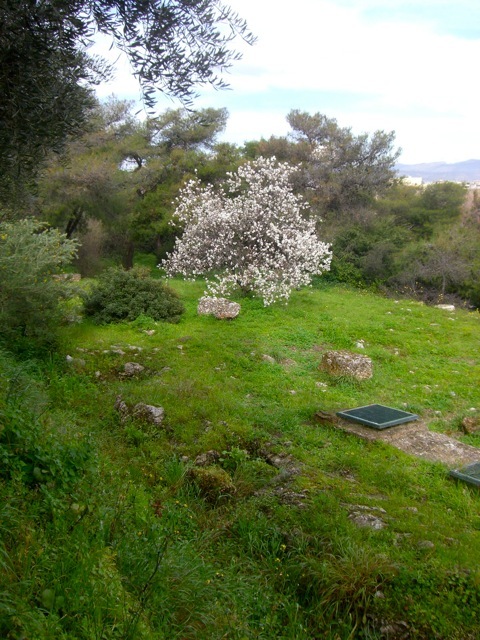 Now there's 43 species of trees on the site -- from almond trees to the ever-present Olive trees. 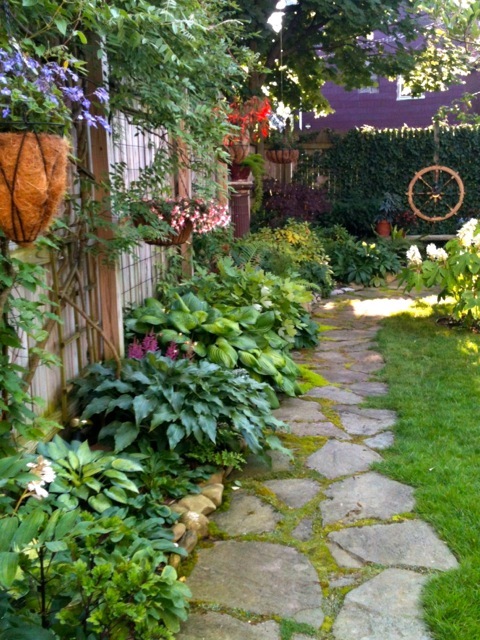 There's also 73 species of deciduous & evergreen bushes, 25 species of climbing plants, 30 species of perennials and 58 species of annuals. None, other than the trees, seem to be planted with any thought or planning. 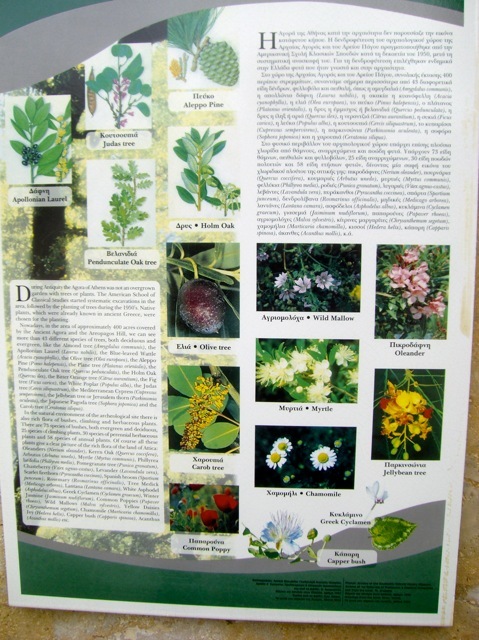 There's one sign that mentions the plantings throughout the area. I think, just by labeling some of the native plantings it may have added just one more layer of interpretation to the grounds. Though honestly, no one's looking at the plants when the ruins of buildings, built around 509 BC, are there calling your attention. 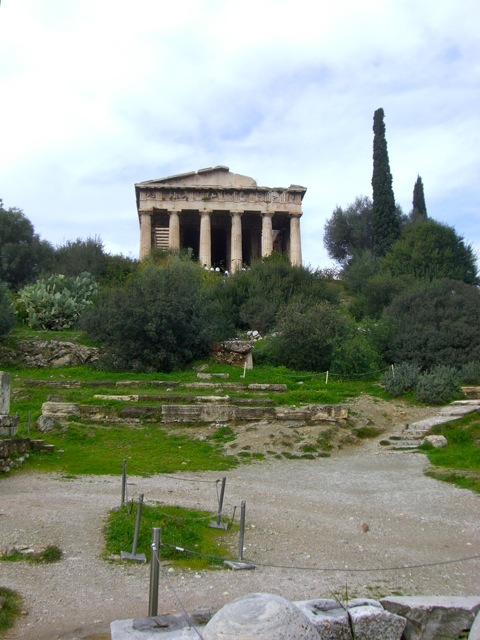 The Temple of Hephaestus, the best preserved of the original buildings in the Agora. 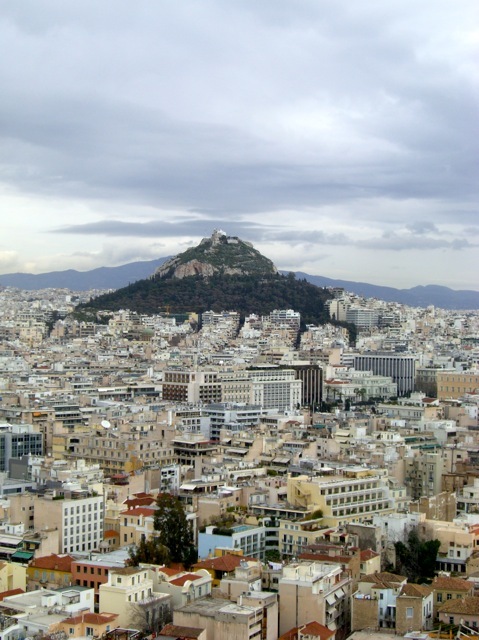 Looking up towards the Acropolis. I believe this is an an Almond tree in bloom. 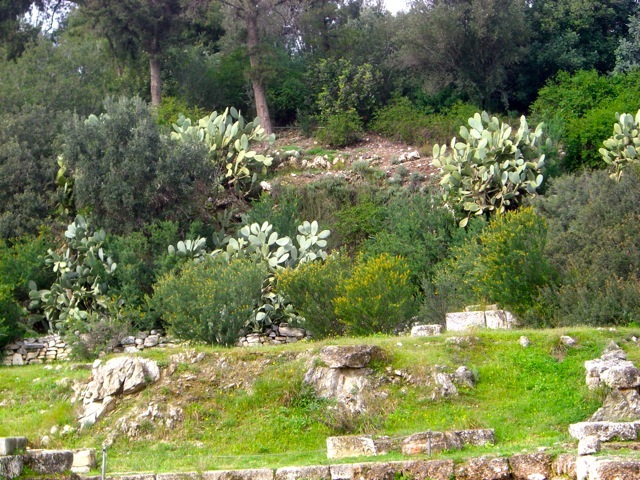 Lots of cactus. this is where all the stray dogs were hanging out. 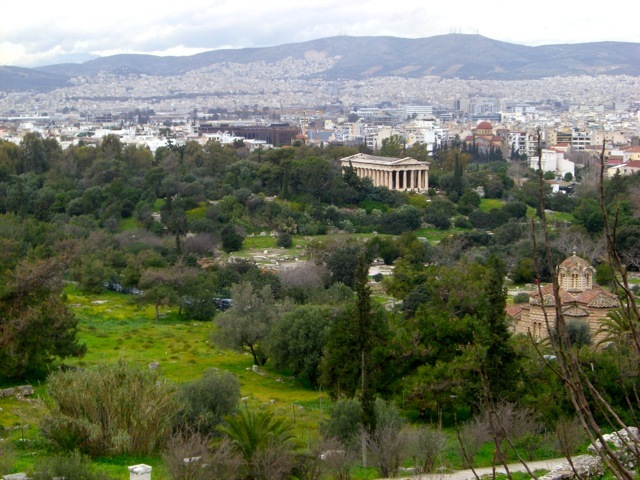 Looking down, from the Acropolis, toward the Temple of Hephaestus. 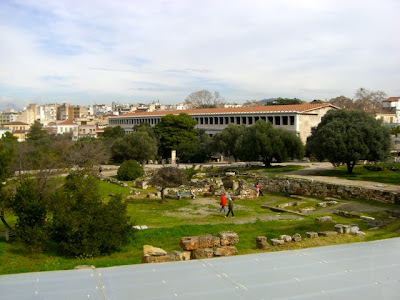 One of the reconstructed Agora buildings, the South Stoa. Thank you John D. Rockefeller for having it rebuilt. 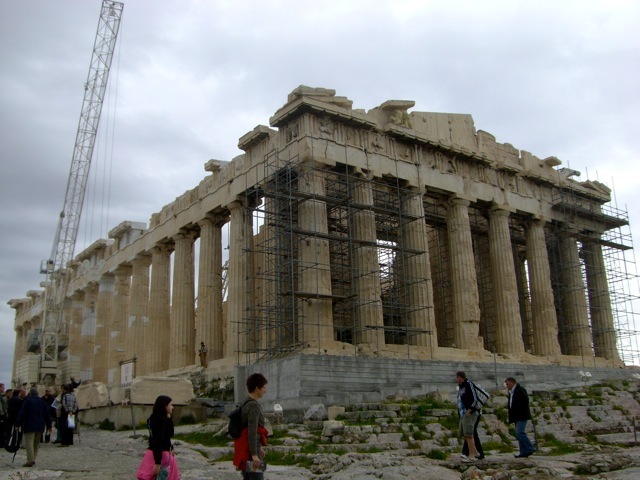 And of course, the Parthenon, the first great example of architectural purity. 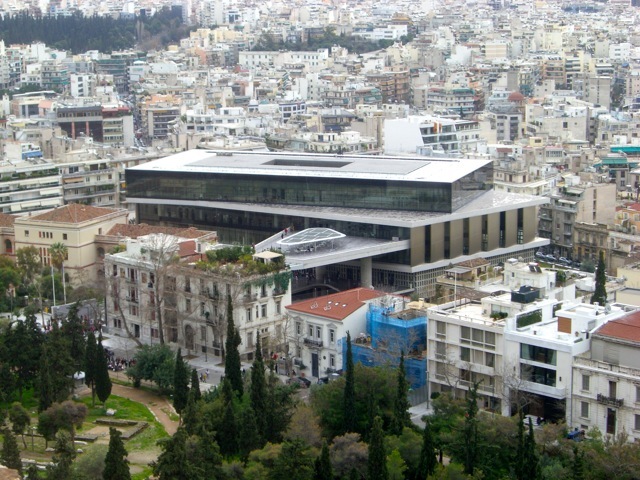 but the top off-kilter floor is the same orientation as the Parthenon. on much of the main floor, so you can see what's going on. 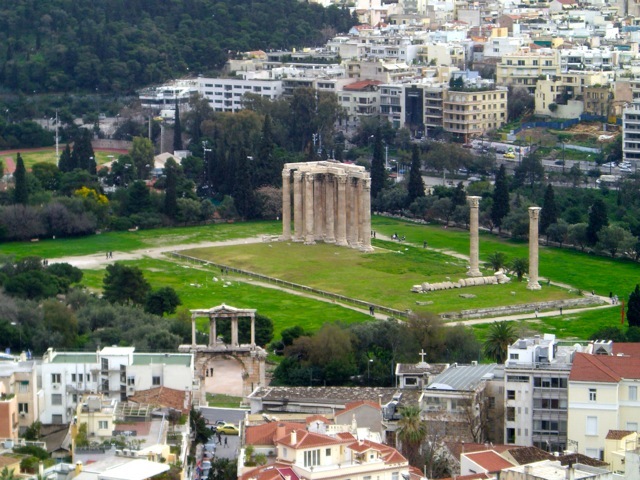 Acropolis site in Athens. 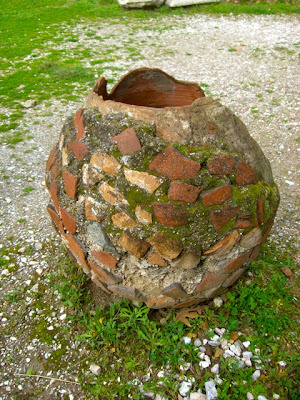 But it didn't have a source of water at the top. 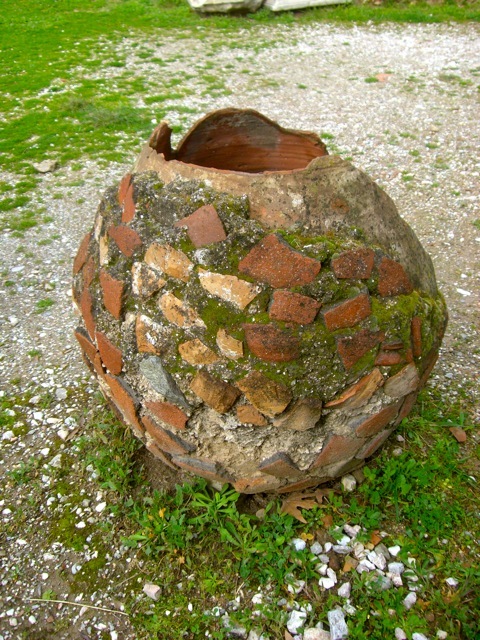 Zuess' Temple. Looks like he had a lot of mowing to do every weekend. 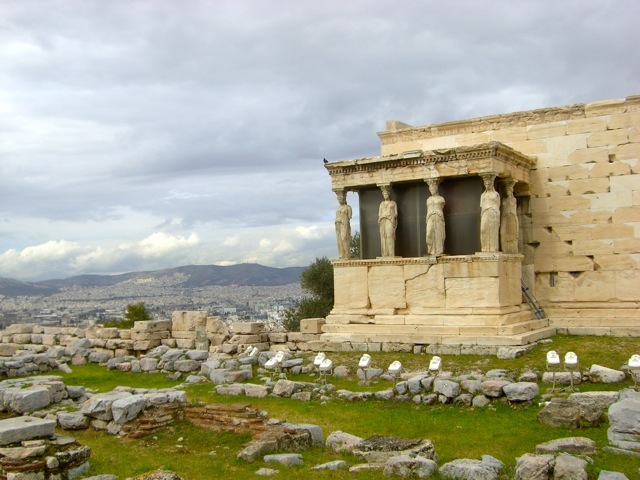 The Porch of the Caryatids on the Erechtheum. Everyone in Buffalo knows the Caryatids. We have a set of reproductions on the Albright-Knox Art Gallery, facing Hoyt Lake. but let's just say the Brits "acquired" one for safekeeping in the lat e 1800s and have yet to return it. gyros, tzatziki, dolmaakia and spanakopita. Greek food in the States is as good as the Greek food in Greece. 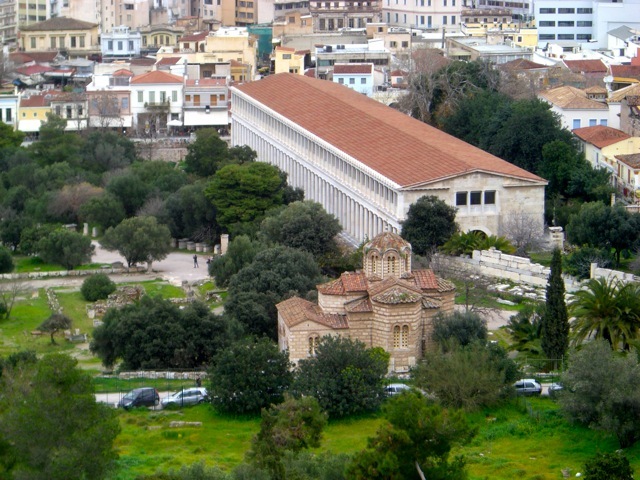 A nice overview of Athens and surrounds. 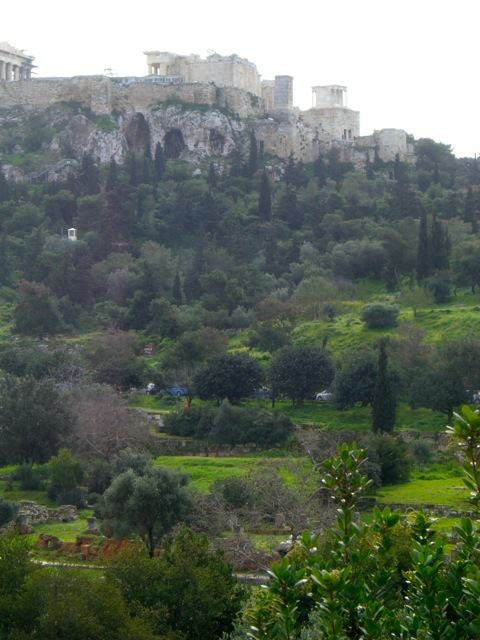 I was there in winter one year, many years ago, so I didn't see the gardens, but we had the Acropolis to ourselves! My son, the archaeologist has worked on two sites on Crete, including Knossos. Funny that we took him to Crete when he was 6 and then he went back to work on the same site as an adult! 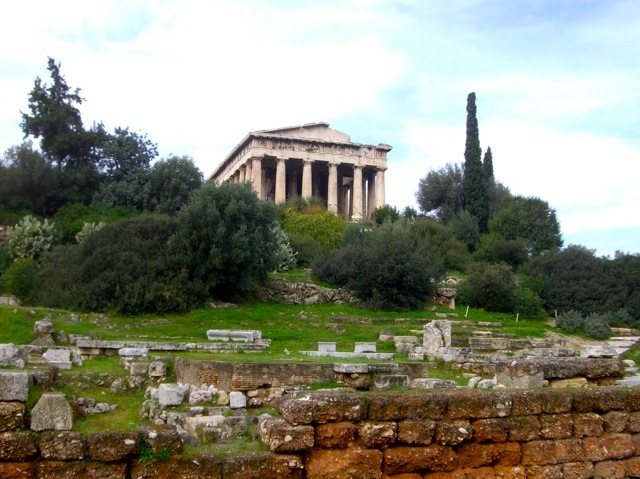 The Acropolis to yourselves -- that would be nice. Plenty of tourists from around the globe on hand otherwise. Your son must've loved his time there. Aren't you still in France currently? I love your post. My sister went to Greece a few years ago. 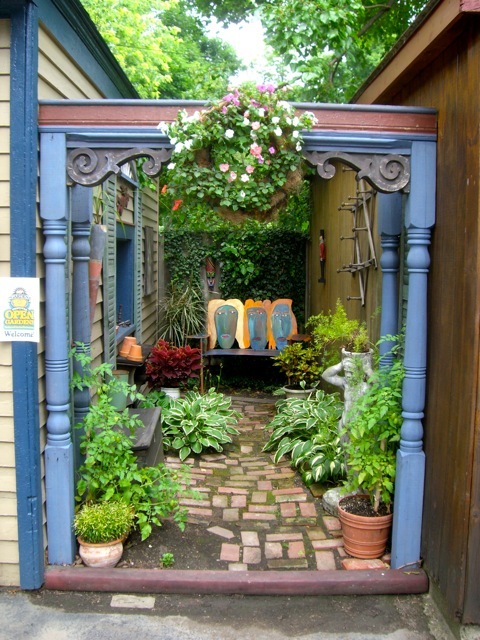 I haven't been, but it's on the "bucket list." Love your tour of Las Vegas "gardens." Funny thing about Greek food. I think it's the only country we've ever gone to where the quality of the food was exactly the same as what you can get here in North America. Italian food is better in Italy. French food is better in France. Mediterranean foo is better in the Mediterranean. But Greek food's basically the same here as there. I've been to Corfu, but never to Athens. I'm itching to travel, and your post has greatly increased the urge. With a Greek godmother, I really should have toured Greece. I'll have a ouzo in your honor, Jim!